From its birth more than 200 years ago, the United States has maintained a tradition of caring for citizens who have served in her military. When there was a need, these Veterans answered the call. And now, our country recognizes and honors its obligations to do the same for the. The Veterans’ Victory House is a modern testimony to this ongoing commitment. With funds provided by the Federal government and the state of South Carolina, the 220-bed facility was built specifically to serve the Veterans of South Carolina. 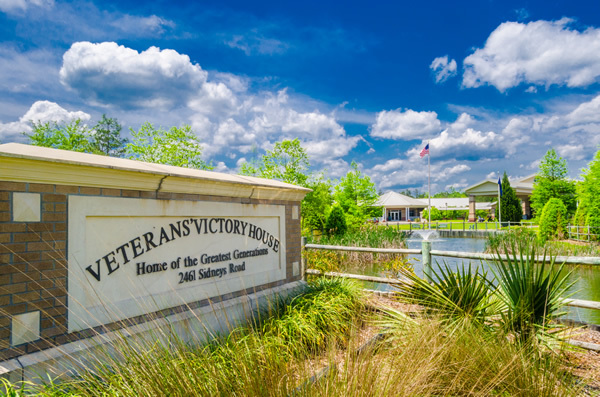 Admission to the Veterans’ Victory House is limited to Veterans who have been separated from the U.S. Armed Forces under honorable conditions and qualify as South Carolina residents who are in need of skilled or intermediate nursing home care. Eligible Veterans must have served on active duty. Veterans’ Victory House is managed by the South Carolina Department of Mental Health and operated by HMR Governmental Services on behalf of the State. For more information, Veterans or their loved ones should contact the Veterans’ Victory House Admission Coordinator at 843-538-3000. Veterans’ Victory House is located in Walterboro in the southeastern or “Lowcountry” of South Carolina. This area features a beautiful coastal atmosphere, scenic lakes, and many active Veteran Service Organizations. Located just outside of Charleston, there is never a shortage of community events through all four beautiful seasons of the year. Veterans’ Victory House residents and staff are appreciative of the volunteerism and support found in Walterboro and surrounding communities.